I lost the pattern I had for this Gingerbread Swan and only had an old picture to go from so I recreated the pattern. The body is baked on a small stainless steel bowl. The wings and tail pieces were curved on top of balls of tin foil. I painted all body pieces with white Royal Icing, then I piped "feather" patterns over the wings and tail. The crown was piped on an upside down funnel, when dry it slid right off! I had a lot of fun making this one. Maybe next time I'll make individual feathers out of gumpaste and glue them all over. Makes a really nice centerpiece---I can put little presents, cookies or candies inside the bowl. I hope to put some instructions together with the pattern pieces for anyone who is interested. I'll post a link here later when I get it done. 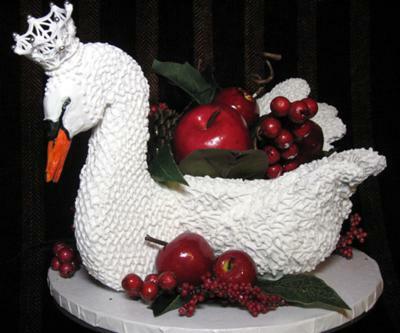 I updated my website where I have gingerbread patterns including this Swan. You can find these patterns at http://costumepastimes.com/gingerbread All free of course! Here is where I found the Swan link to make this. Thanks so much for sharing. I found the link, thanks! If I make it I will post a picture! This is so kewl. Did I overlook the link? I could not see the link to download this beautiful piece of work! Please let me know how I might do that. Thanks so much for sharing. I am subscribing to your page. I just finished the patterns and instructions for the Swan King (PDF format). Totally free---just if you make it submit a photo here! Amazing!! That's all I can say! Truly a work of art-outstanding detail! You're a genius.